But, no matter what noise there is, it is critical, in a 911 center, for the dispatcher to be accurate and precise with each call and radio transmission, 100% of the time. Getting it right the first time can be a life or death situation for a dispatcher. This is why training to be a dispatcher takes so long, along with additional time of on the floor training with close supervision. Dispatchers take pride in their work and really do want to get it right no matter what the call. Noise can be a major stress and a distraction that can lead to mistakes. Unwanted or additional noise tends to wear you out over the course of a day. Imagine working in a daycare center with all the kids yelling all the time. Would you not going home totally exhausted? The same holds for a noisy dispatch center. Hang acoustical paneling on the wall. This is a good place to start for reducing the overall noise of the room. This type of acoustic is good for reducing echoing and reverberation. Carpet is better than a hard floor. This is often a dust collection debate at a 911 center, but the “click-clack” of someone walking around is a huge distraction. Ceiling tiles designed for noisy environments. This is a simple and inexpensive upgrade to reduce noise. However, this is not always available in 911 centers due to the room design. Headsets. By now, most dispatch centers have switched over to headsets so dispatchers no longer need to yell into a external microphone, reducing noise. Soft close drawers on file cabinets and personal storage. This is what you see in high end kitchens. The drawers and doors self close silently for the last ¼” or so. This also prevents the slammers from slamming the door shut. 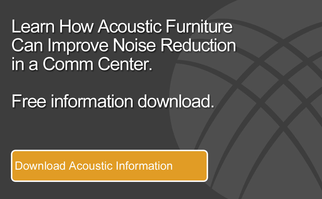 Furniture is the best way to reduce the noise as it is at the direct source of noise for the dispatcher. Different furniture manufacturers make their furniture out of different materials. Which materials work the best? Steel is the noisiest by far. Sheet metal doors and panels reflect noise and are loud when they open and close. Acoustical fabric is the best as it can really reduce the noise. Look for a NRC (Noise Reduction Coefficient) rating of the panel system. A NRC of .55 should be the minimum rating. Keeping your dispatch center reasonably quiet will benefit the dispatchers as well as improve the quality of care all dispatchers want to deliver to the people they serve.